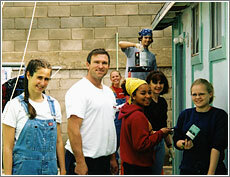 Solidarity Painting is based in Santa Rosa, CA and was established by Greg Kuzmicki in 1990. Greg has been in the painting trade since 1978. He first started painting in San Francisco in the early 80’s and later in Marin County. From waterproofing 25-story high rises to restoring and painting mansions in Pacific Heights and everything in between, Greg has done it all. A long time Sonoma County resident, Greg lives with his wife and two children in Santa Rosa. Solidarity Painting provides quality service at a fair price. We strive to be competitive on every project. But, price is only one component of a successful project. We have many repeat clients that have followed Mr. Ruskin’s advice below and continue to select Solidarity. It’s because of our quality, integrity and service over cut-rate contractors who fail to deliver. Most complaints from consumers are about the quality of work, unfinished work, or the attitude of the painters. It is amazing, because those same consumers hired the lowest priced contractor and bragged about the bargain they received. The lowest bid can be the most expensive in the long run. The solution is simple. You usually get what you pay for. Don’t hire based on price alone. Hire a contractor based on their last ten completed jobs. Get a list of names, addresses, phone numbers, and contact those people. Ask them if they were satisfied. Some people are more easily satisfied than others, so go see the jobs if you can. Pick your contractor based on jobs that are like yours, both in size and type of work. Make sure the contractor can do your job within your time frame. Highest rated Sonoma County Painting Contractor. Highest Rated Marin County Painting Contractor. Check us out with BBB and Diamond Certified. Solidarity painting shares some of its good fortunes by giving back to local charities as well as far away neighbors. In the photo below, Greg, and members of a local Santa Rosa Church, helps those less fortunate in Tijuana Mexico. Greg helped with the painting, but David Fisher of Santa Rosa deserves the credit for organizing all missions abroad. Greg met David, a fellow contractor who re-finishes and installs beautiful hardwood floors, while painting his home. David gives much of his time to others year after year. Solidarity Painting is Diamond Certified. It's one more way you can be assured if you go with us you're going with the best. Read more quotes like the one below. Visit the Diamond Certified web site. "Their preparation and attention to detail was superb. They were also friendly and courteous. They were the best painters I have ever seen." - Sam V.